On behalf of SOLIDWORKS team, thank you to everyone for ideas submitted to the SOLIDWORKS World 2019 Top Ten List. We are happy to see that even though the idea submissions window was a little shorter this year, the number of submissions is on par with previous years. This shows a lot of enthusiasm! Now that the idea submission window in closed, it’s time to vote! Use the sliders to change the percentages between them. You can provide more specific feedback using the comment box. You must save your vote for this section before being able to vote on ideas, but you can update your resource allocation ratings anytime you visit this site. 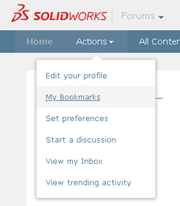 To review and vote on ideas for the SOLIDWORKS World 2019 Top Ten list, access the SOLIDWORKS World 2019 Top Ten List and click the “Content” tab or click the “SWW 2019 Top Ten List” link on the Forums Home page. You are allowed to vote on as many ideas as you like. Voting will close on Thursday, January 31, 2019. We hope your enthusiasm carries over during voting. How many votes will be cast overall? Will any ideas get hundreds of votes? It’s all up to you! If you have saved some of your favorite Ideas as bookmarks, you can find them again by clicking Actions -> My Bookmarks and browsing your saved bookmarks from there. The Top Ten Ideas will be announced at SOLIDWORKS World 2019 in Dallas, February 10-13. We look forward to seeing you there! Register today!